Meknes (Arabic: مكناس‎, Berber: ⵎⴽⵏⴰⵙ Mknas or Ameknas, French: Meknès, Spaingie: Mequinez) is a ceety in northren Morocco. It is served bi the A2 expressway atween those twa ceeties an by the correspondin railway. Meknes wis the caipital o Morocco unner the reign o Moulay Ismail (1672–1727), afore it wis relocatit tae Marrakech. The population is 1,000,000 (2012 census). 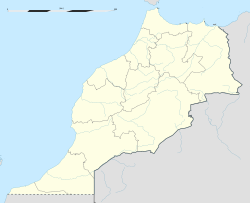 It is the caipital o the Meknes-Tafilalet region. Meknes is named efter a Berber tribe which wis kent as Miknasa (native Berber name: Imeknasen) in the medieval North African soorces. ↑ "Climatological Information for Meknes, Morocco", Hong Kong Observatory, 2003, web: HKO-Meknes.